Well done to our camógie girls!! Home » News » Well done to our camógie girls!! 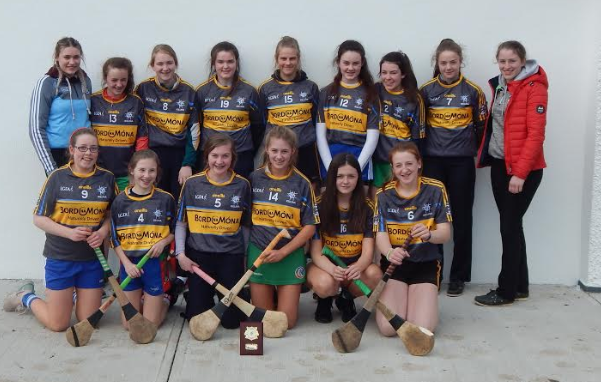 Well done to our Junior camogie team who qualified for the Leinster Novice Camogie Finals today in Dunganny, Co. Meath. Maeve McGreal providing the goals. Next up for the Killina girls was St. Joseph’s Mercy, Navan but a strong start with 1-1 from Saorah Doyle and 1-3 from Ava O’Brien put Killina into an early lead and a resolute defensive performance from Ava Dolan, Rachel Dillon and goalkeeper Robyn Evans saw the Navan school kept scoreless. A tough second half with hard work throughout the field from Ciara Wyer, Niamh O’Connell and captain Kaithlynn Spain saw Killina into the playoff final. Boyne CS provided the opposition in the playoff final and an early goal from Saorah Doyle saw Killina take an early lead. Good work from Chloe Buggy saw Becky Watkins break through for a goal and she followed it up with a second minutes later to leave the Killina girls comfortably ahead. A free from Ava O’Brien and a Saorah Doyle effort were enough to see the victory out with Eivile Jankunaite and Kaithlynn Spain’s work rate keeping the Boyne school pinned back for most of the second half. The girls now go on to the Leinster finals in Laois in May.